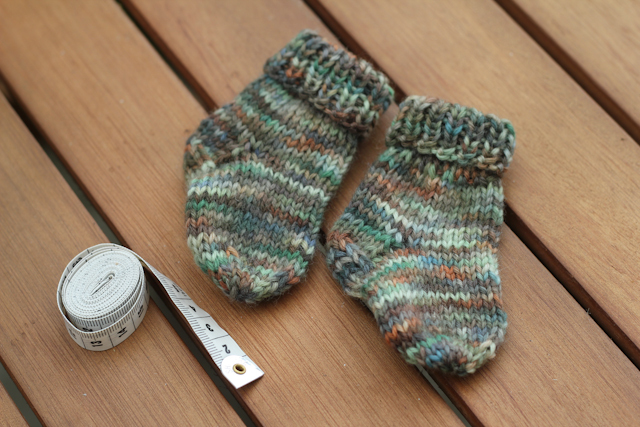 As so many people like my newborn socks and some of them asked me to make the bigger size pattern too I finaly did it. I used double knit yarn, but it was actually quite fine for double knit (it allways surprises me how yarn can vary in DK range). The pattern is similar to the newborn sock pattern, only the rib part folds in half when the sock is done, so it is made to be much longer than it was in newborn socks. Of couse, you can make the rib small, then you need to make 5, or 7, or 10 (definetly not less than 5) rows of rib in the beginning instead of 15. So again you will need a bit of yarn and 2.5mm double pointed needles. Cast on 28 stiches and divide them between 4 needles. There will be 7 st on each needle then. We'll work in rounds starting with the 1x1 rib. Round 1: *k1, p1*, repeat 9 more times from * to *. then work only on first and second needles, which means - with 14 st. Take them to one needle and work in rows. Row 28 - 31: repeat row 16-17 two more times. Knit that 6 st from the top of the heel, then cast on 4st along the side of the heel, knit the stiches from 3rd and 4th needle, cast on 4 st along the other side of the feel. Now you should divide stiches as following: 7 st on the 1st needle (4 from the side of the heel and 3 from top of the heel), 7 st on the second (the same as on the first one), 7 st on the 3rd, 7 st on the 4th. Then you need to start decreasing to form the toes. K2tog in the beginning and end of each needle in every second row twice, then knit every two st together. You will have 6 st left. Cut the yarn leaving 15cm long tail. Using the tapestry needle sew the last st together and hide the yarn ends.